Do Parrots Make Good Pets for Kids? Parrot and Kids: A Good Mix? It never fails -- your child sees a movie, cartoon, photo, or television special showing a gorgeous talking parrot, and all the sudden, it seems like the kid has gone "bird crazy." You are showered with requests to get your little one a pet parrot of his or her very own, and understandably, you might be apprehensive about doing so. For years, parents have wondered whether or not parrots can make good pets for children, and many of those questions are due to scenarios just like this. If you have recently found yourself in this sort of situation, then you have come to the right place! 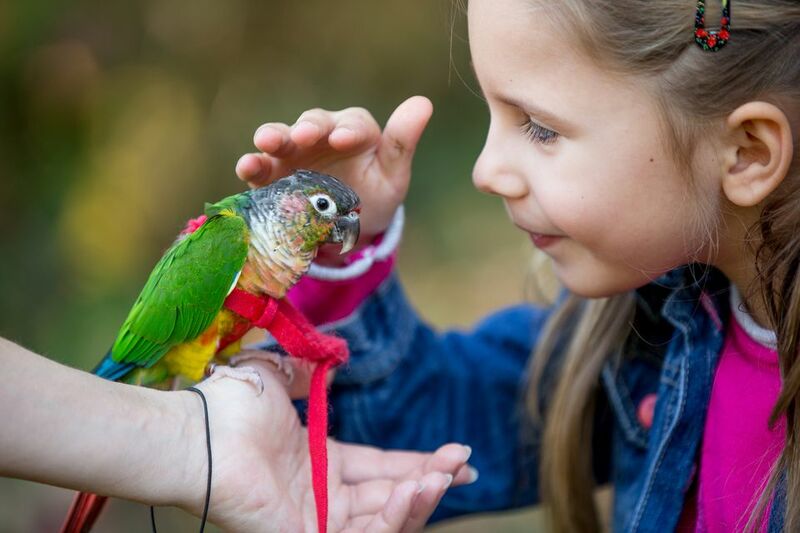 In this article, we will take a look at what goes into keeping a pet parrot, basic bird personality traits, and ultimately, whether or not parrots are a good choice as a pet for young people in general. Parrots can be dangerous. Parrots both large and small are essentially wild animals. Even very tame parrots have the capacity to seriously injure people with their powerful beaks and sharp claws, even if they don't mean to. Children are at risk due to their tendencies to make quick movements and loud noises that could frighten a pet bird. If you do consider a parrot as a pet for your child, it is advised that you don't allow the two of them to interact without close adult supervision. Parrots can be messy and take up a lot of space. By nature, birds create a big mess when they are eating, drinking, and playing. Many times, children can overlook big messes like this when their parents simply cannot. If your child wants a pet parrot, he or she will need to understand that the bird's cage will need to be thoroughly cleaned every day in order to keep the bird from getting sick. Proper hygiene is essential to stop the disease from spreading to both the bird and the child. In addition to all this, parrots need large cages and lots of "parrot proof" space to exercise and play. Parrots can live for a very long time. Many parents are apprehensive about making a commitment to a pet with a longer than average lifespan, and understandably so. For this reason, it's important for parents to realize that parrots can live for up to 50 years or more when properly cared for. The decision to adopt a parrot is not one to be taken lightly! Parrots can be expensive. Kids normally don't work for a paycheck, so it's easy for them to look past the costs of caring for a pet. Not only do pet parrots normally cost quite a bit to purchase, the costs of a proper cage can run into the thousands of dollars, and paying for a visit to an avian veterinarian can cost hundreds if the bird needs treatment. As mentioned before, these are only a few of the points that should be considered before adopting a parrot. Having a bird in the house can change your life in ways that many people can't possibly imagine. Your decision to allow your child to have a pet parrot should be based on your child's maturity and responsibility level, your own ability to pick up any slack where the bird's care is concerned, and jointly, whether or not you and your child can work together to provide a pet bird a happy and loving home. Be sure to take the time to do plenty of research and not make any hasty decisions about adopting a parrot. Doing so will not only save your family the trouble and heartache of adopting a pet that you won't be able to keep but will be a great example of proper, informed decision-making to your little one. Good luck!